If you work in the tech sector you probably know your BYOD’s and UI’s backwards and forwards – your marketing strategy has taken market trends and competitors into account, your site is optimized for the right users and terms, and your paid search activity is looking good. Everything works like a well-oiled machine… until you’re looking to expand into non-English speaking markets. Well, technology is a global language, right? 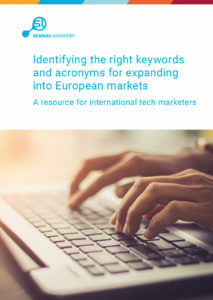 Before expanding into a new market (or jumping into hasty conclusions as to whether the same tech acronyms or terms are used in it), check out our ultimate guide to avoid pitfalls like accidentally competing with recipe sites or big banks.